We just told you how you can buy the Microsoft Band 2 and save $50 on your purchase. 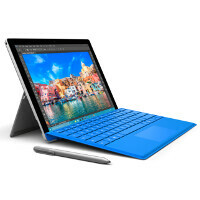 Now, we'd like to tell you how to save $100 on the purchase of all versions of the Microsoft Surface Pro 4 available in the U.S. All you need to do is purchase the tablet from the Microsoft Store from now through February 27th. Intel Core i7, 16GB RAM, 256GB of storage: $1699, down from $1799. Also on sale is the AT&T version of the Microsoft Lumia 640. The phone is on sale for $49 off contract, a discount of $10.99 or 18.3%. The handset is equipped with a 5-inch screen carrying a 720 x 1280 resolution. The Snapdragon 400 SoC is under the hood with a quad-core 1.2GHz CPU. 1GB of RAM is inside along with 8GB of native storage. Those seeking additional memory can access the 128GB capacity microSD slot. An 8MP camera can be found on the back of the unit, with a .9MP front-facing camera for snapping selfies and handling video chats. Whether you need a new phone or a new tablet, looks like the Microsoft Store has your back for the rest of this month. Save $100 on the Surface Pro 4 in the U.S.
Walmart had the 640 on sale for $30 last week. At first, they're selling it at an expensive point. Now that they've reduced the priced by $100. Microsoft seems to be really loosing. Temporary price cuts are considered "loosing"? What are you smoking?